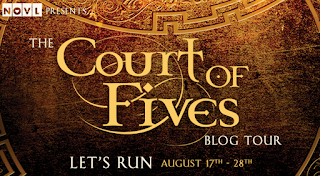 Welcome to the blog tour for Court of Fives by Kate Elliott! I am so excited to present this lovely author and her fabulous novel to you. Check out my four-star review of Court of Fives, if you need to be convinced to read this one! 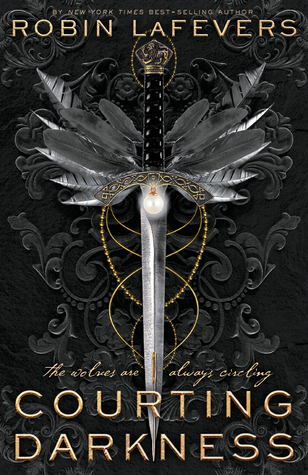 Learn a little bit more about the book in Kate's guest post below - enjoy! 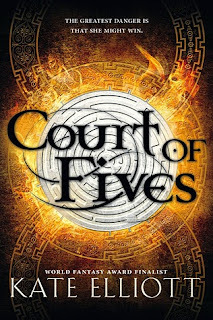 As reviews and comments about Court of Fives start rolling in, I’ve seen a few readers refer to the novel as a dystopia. That surprised me because I did not write it as a dystopia, and I never intended to write a book that fit into the dystopian genre of YA. My goal was to write a story first of all about Jessamy, a fierce competitor who can’t compete in the sport she loves, and then explore why she can’t and what happens when, for the worst possible reasons, she suddenly can. I also wanted to write a riff (not a re-telling) on the theme of Little Women: Basically I wanted to write an epic fantasy with four sisters. As I did research on Greco-Roman Egypt and how it compared to the earlier (and better known to us in modern times) Egypt of pyramids, mummies, and pharaohs, I began noticing cultural differences in how women were treated. For example, the ancient Greeks practiced infanticide. Children who were deemed too sickly or too inconvenient were exposed and left to die. In particular, “excess” girls were killed. In classical times the Greeks who traveled to Egypt often noted with surprise that Egyptians kept all their children--even the girls!--and raised them all (that is, all who survived the normal run of disease and injury that caused many children to die young). Instantly I had the seeds of a great conflict in a land in which outsiders (the Saroese) conquer and rule the country of Efea. The Saroese naturally would introduce their own customs and laws, which would contrast and often directly conflict with the original and more egalitarian Efean traditions. For example, if a man of Saroese/Patron ancestry (read: Greek) had a relationship with a woman of Efean/Commoner (read: Egyptian) ancestry, and she gave birth to four daughters one after the next, she would think nothing of raising all four daughters but to the Patrons around him, his agreement to raise all four daughters, especially when he has no son, would seem inexplicable. In fact over and over again I rarely needed to make up ways in which the women of the Court of Fives world labor under regressed rights. All I had to do was borrow from actual historical legal traditions. The contrast between the legal rights women had under Greek laws and under Egyptian laws gave me a lot of material as well. Under Greek law in Greek-ruled (Ptolemaic) Egypt, a woman of Greek descent who wanted to bring a case to court or engage in legal business transactions could only do so if an adult male agreed to act as her guardian and bring the case to court on her behalf. Such women had no legal standing in their own person. However, Egyptian women did not need a male guardian to bring cases to court or engage in business. They could do it on her own because Egyptian law gave women legal autonomy. Using historical details made it easy to create a society that treats women as legal inferiors, and of course I took that a bit farther--exaggerated it, if you will--with customs like the ill-wishers and the oracles that are actively hostile and even cruel to women. At the same time I tried to quietly contrast how different Efean society is as we catch glimpses of Efean women running the Fives and presiding over community disputes as “dames” (elders). Writing a story with regressed women’s rights reminded me of how it’s not really that long ago that women got the right to vote, reproductive rights and the right to physical autonomy, and the right to education in many cultures (all fights that are still ongoing). Only 200 years ago a woman who married in the UK or USA lost control of her property to her husband, and laws protecting her property as hers didn’t start being passed until the 1840s. The opportunity to compete in sports for girls and women as an ordinary thing has happened in my lifetime; in the Olympics women weren’t allowed to compete in the marathon at the Olympics until 1984 (1984!!! ), the pole vault in 2000 (2000!!! ), and women’s ski jumping was only finally allowed at the Winter Olympics in 2014. Yes, that’s right: 2014. 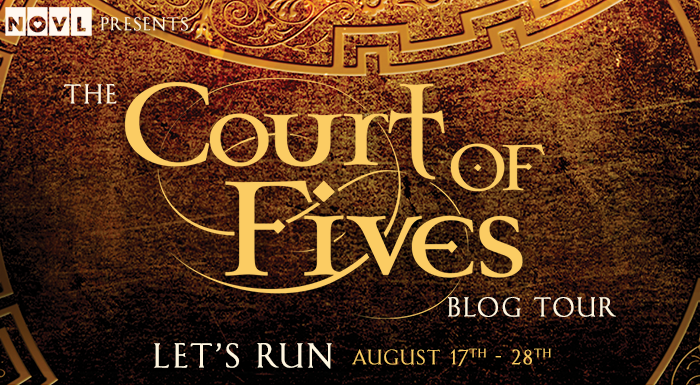 In that way, the struggles of the women in the world of Court of Fives aren’t all that removed from our own. True! But I saw it as more of a historical thing - historically speaking, the Greeks had class names like that (Patricians, Plebeians, etc.). So I saw things like Kate did. Unfortunately, most people don't know much history, so they immediately assume "dystopia". yes, good point! 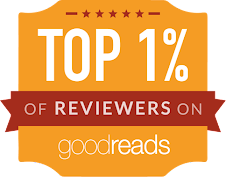 That makes perfect sense in the context of current YA, and I'm learning a number of things by reading reviews that weren't things I had considered beforehand because my prior publishing experience is in the sff genre. Alyssa, That's exactly what I intended. 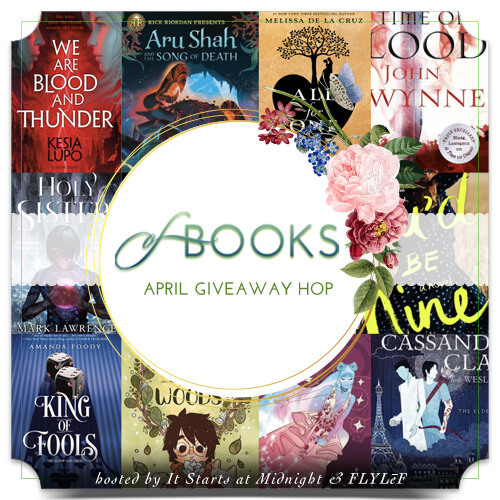 Also, again, thanks for the blog tour spot! Different perspectives are great! And I'm glad I got this one in the light you intended, Kate :D You're very welcome - and thank YOU!